Lost Crow Conspiracy is the much anticipated second book in the Blood Rose Rebellion series by Evelyn Skye, and I'm thrilled to finally get my hands on it! I read Blood Rose Rebellion last year and really enjoyed the uniqueness of the story, and I was super curious to see what was going to happen next in this sequel, especially after the ending of the first book. One of the things that I've enjoyed the most about this series is that there are so many interesting characters, including the main character, Anna. I had found Anna to be a little frustrating during the first book, but did not have that issue this time around. Yes, she's still trying to find herself in this book, but she seemed much more confident in this book. During a time where most women are told to basically be quiet and look pretty, she was anything but. I liked how she stayed strong even when it seemed like everyone in the world had turned against her, and she stood up for what she believed in. I enjoyed reading the story from her point of view. We ALSO get the story from another character's point of view, but I'm not going to say who that person is, as I'm not really sure if it's too much of a spoiler or not, so read the book to see who I'm talking about. I actually loved this person's part storyline SO much! The storyline for this book is both really unique, as well as really interesting! I haven't read too many books set during this time period or setting, but it's definitely interesting and makes me want to read more. I'm curious to know if this book is the final book in the series, or if we will get another, (or more), but I haven't found any definite information on that yet. The book definitely leaves off with some things undone, so I'm assuming that there may be a sequel, but I'm not entirely sure. If there will be another, I'm curious to see what happens next. 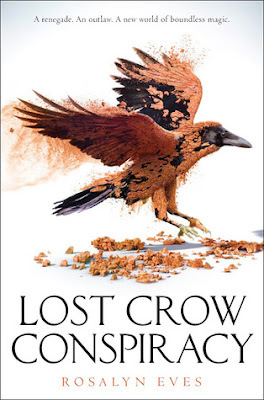 Overall; Lost Crow Conspiracy was an interesting sequel to Blood Rose Rebellion, and I'm so glad to have had the opportunity to read it! I'll definitely be keeping my eye out for info on if there will be another book in this series or not, as I'm super curious to know if this was the end, or if we will get more.